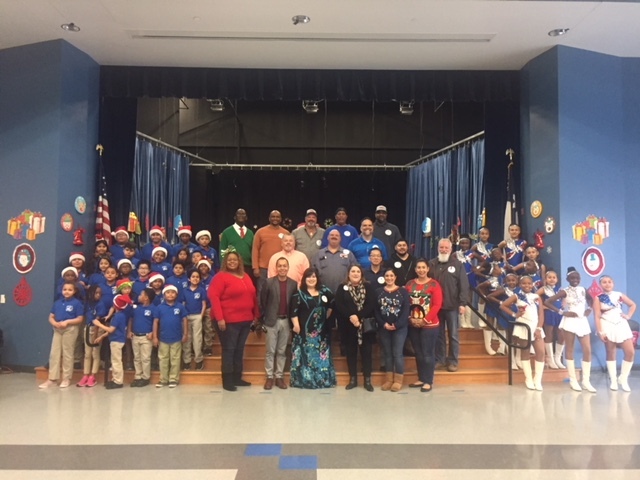 This past Christmas, Kloeckner’s Houston Branch held a toy drive for students at Almeda Elementary as part of the KloecknerCares program. The employees at Kloeckner Houston collected money which they then used to go out and buy toys. During breaks and lunches, people would gather in the conference room to wrap the presents. The facility achieved almost 100% participation including the office, the warehouse, and the drivers, resulting in a pickup truck full of gifts for the children. “It was a nice break during those lunches of wrapping the gifts for the children because it did wonders for all of us here and brought us together as a family doing good for others,” said Cindy Cavazos, an account manager at Kloeckner Houston. When the folks from Kloeckner arrived at the elementary school with all the toys, they were treated to a real surprise. The children were putting on a program just for them with singing and dancing. The school is just down the street from the Houston facility, so close that the Truck Drivers pass it on their routes. This made it an obvious choice when the KloecknerCares call went out. Almeda Elementary is the perfect place for them to start helping in the community. “I think that when you realize that your neighbors, someone who is less than a quarter mile from us, if you can start there and make a difference, you are truly making a difference in the community where we work, where we go to lunch, where Kloeckner sits,” Cindy said. The toy drive isn’t just a one-off event, either. It is part of an ongoing partnership between Kloeckner Houston and Almeda Elementary. The partnership began with a Thanksgiving food drive. Kloeckner Houston wanted to start small, collecting food for six needy families at the school. They gathered up the Thanksgiving meals with everything from the turkey to all the fixings. Next on the docket is a mentorship program that is beginning to take shape. The counselor at Almeda requested that a few of the men from Kloeckner come down to the school and meet with some of the boys at the school a few times over a few months. The men will talk to the kids, read books with them, and just show them how you can have a career, a family, and everything else you need to be happy in life. In early January, Almeda Elementary called Kloeckner Houston. Two of the students had lost their home in a fire during the night. The family was in immediate need of some school uniforms. Within 20 minutes, Kloeckner Houston had collected enough money to get the uniforms. That is the kind of relationship it is.